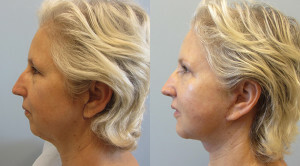 Our patient is a 57-year-old female who had always been unhappy with her profile appearance. The patient felt that her nose was too large and that her chin was too small and recessive. After much deliberation, the patient decided to undergo a chin implant as well as a facelift, neck lift, and upper eyelid lift. Dr. Traci Temmen placed a medium-sized prosthetic chin implant through a small incision placed on the skin under the chin. Postoperatively, the patient’s profile appeared much more balanced and elegant and made the nose appear much smaller.